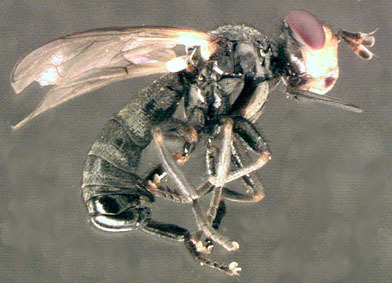 Thecophora atra, female, from Bioimages. Thecophora are small greyish Conopid flies, that dwell in the vegetation. They are not often observed in the field. Most flies are spotted in open grasslands in forested environments, while visiting flowers. Flower visits include yellow composites as Crepis biennis. Thecophora are greyish in general appearance. They resemble Zodion, but Zodion has but a single bent in the snout. Stuke (2006) sheds light on the former T. pusilla, showing that multiple species were hidden. T. cinerascens, T. bimaculata and T. jakutica appear in the Netherlands. Abdomen and theca of female of, first, Th. melanopa, with theca laying flat against the sternites and, second, Th. atra, with theca erect. Abdomen and theca of females of, first, th. cinerascens, with theca rounded and, second, of Th. atra, with theca elongate. Note: The coloration of femur 3 is tricky at this point because T. bimaculata also has a pale femur 3. Stuke (2006) does not refer to the males. 14.b. 2nd antennal segment as long as or shorter than the 3rd segment; femur 3 often only yellowish on its basal quarter. 4-5 mm. -> Thecophora cinerascens (Meigen) (=Th. pusilla) and Thecophora bimaculata, two further species in the eastern palaearctic. Stuke J.-H. 2006. Thecophora pusilla auct. - ein Artenkomplex. Beitr. Ent. 56(2): 269 - 279. Van Veen M. 1984. De Blaaskopvliegen en roofvliegen van Nederland en België. Jeugdbondsuitgeverij, Utrecht.